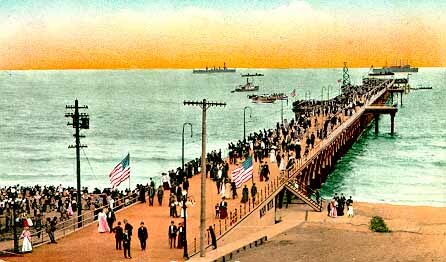 Santa Monica's role as a tourist center was eclipsed with the opening of Venice of America in 1905. 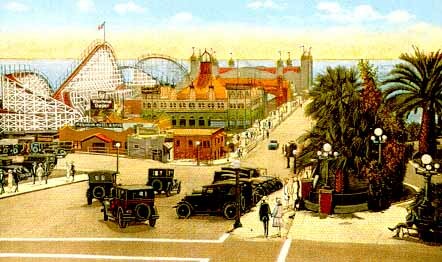 As both Venice and Ocean Park expanded their appeal by building huge amusement piers, crammed with roller coasters, dance halls, auditoriums and dozens of rides and attractions, Santa Monica's business leaders sought to build their own amusement pier but without the honky-tonk atmosphere. The city had built a fishing pier in 1909 on the site of the old railroad pier to extend the sewer outfall seaward so that it wouldn't pollute the nearby tourist beach. In 1913, projects reported in the press like a new North Beach Bath House and a small amusement pier in front of Schrader's Seaside Hotel, never gelled. Voters in 1914 turned down a $150,000 bond issue to build an auditorium either on the municipal fishing pier or on donated land south of the pier. After Edwin Benjamin in 1915 bought the beach front south of the pier for $125,000 and announced that he would build a 700 foot long amusement pier, but failed to deliver, Santa Monica's business community was disappointed yet again..
Their hopes rose when Charles Looff, a well known Long Beach amusement operator and carousel builder, purchased the northern 200 feet of Benjamin's beach front property for $50,000 in February 1916. Looff announced plans for a 700 foot long by 200 foot wide amusement pier that would open May 31st. He reported to the Santa Monica business community that he would invest $400,000 in the project and that within a few years he would extend his project further seaward. 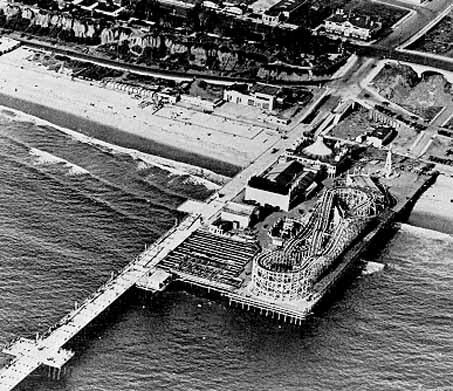 Looff said that he choose Santa Monica to build his amusement pier because, "the bathing beach at Santa Monica is well-known as one of the finest on the Pacific Coast, it attracts the highest class of people, and transportation facilities afforded are unequaled." Charles Looff didn't waste time in starting the mammoth project. He bought all the available cresoted wood pilings in Southern California and had additional piles shipped from the northwest. He bought half a million feet of lumber for the pier platform and increased his ocean frontage to 247 feet by buying land from Benjamin for $250/foot. Benjamin was busy too, grading and improving his 350 feet of ocean front footage north of the pier. They built a roadbed for the extension of the Pacific Electric's 'Air Line' route from downtown Los Angeles which allowed passengers to arrive at Santa Monica's beach adjacent to the pier. The trolley line also made it easy to transport pilings and lumber to the pier site. Charles Looff and his two sons Arthur and William arrived to supervise the pier's construction. Arthur as building superintendent for many of his father's projects began driving the first on Saturday March 25th once Looff's custom designed electric driven pile driver was assembled. It was unique in that it used a jet of water to wash out the sand beneath the pile so that only light blows were required to drive it into the ocean bottom. Two days later Charles Looff made a formal written application to the City Council for a twenty year pier franchise. Meanwhile work on the pier progressed rapidly. They drove rows of thirty piles along the pier's 247 foot width and reached the water line in eight days. Carl Schrader, a local businessman, tried to derail Looff's pier project on April 5th by offering to build a pier on the Municipal Pier's north side and the right to connect it to the city's pier. Then he protested at the Council's next meeting that Looff shouldn't be allowed to built any closer than 100 feet to the city's pier. When several other men tried to spoil the project, Mayor Berkley and Commissioner Carter warned the opposition that Santa Monica for once had a chance to compete for tourist dollars and that they shouldn't let one or two men spoil it. But opposition continued to smolder. Schrader accused Looff of not having clear title to his property and Looff had to dispel rumors. Letters began arriving in city hall supporting Schrader and urging the city to get $5000 / year for the pier franchise. Then local preachers demanded that all gambling concessions and the sale of liquor be prohibited by the terms of the franchise. Once Looff conceded to his opponent's demands that the restrictions be part of the franchise agreement, the city advertised the sale at an auction to be held on May 31, 1916. While it was unusual for an entrepreneur to build a pier before the franchise was granted, Looff had to proceed without one if he was to complete his pier for the 1916 summer season. Fortunately for Looff, he submitted the only written bid. Others were given the opportunity to submit oral bids, but none did. He paid the city $200 outright and pay the city 2% of the pier's gross after five years. With the pier franchise secure Looff immediately announced details of his pier's attractions. He had purchased a racing roller coaster that had been featured at the 1915 San Diego Exposition and had fifty men dismantling the ride. His Long Beach factory was fabricating the world's largest circle swing and a menagerie animal carousel for his two-story hippodrome, the most prominent building on the pier. He also planned a fun house, restaurant, and a dance hall 200 x 150 feet. Although a longshoreman's strike that delayed the delivery of lumber and hammered work, by July 31st his workers had driven piles 720 feet out from the promenade. They were only weeks from completing the pier's deck and worker's were methodically reassembling the 550 x 110 foot roller coaster that stood 60 feet high. They tested the ride on August 2nd and opened it to the public the following evening. Both the Whip and Aeroscope (circle swing or flying boat ride) were installed on the pier in early August, and visitors were riding Looff's ornate carousel. Looff's pier was more successful that he hoped. It was crowded throughout the remainder of the summer and on weekends throughout the fall. With space needed to accommodate the crowds, they planned to lengthen the pier to 1055 feet and add new attractions that winter. His single story bowling and billiards building, west of the hippodrome opened on January 17, 1917 and in May they opened a walk-thru fun house. Bands entertained visitors from a platform near the pier's picnic grounds. Looff incorporated his pier in September 1917 as a public corporation and sold $75,000 in preferred stock. The money was to be used towards building a restaurant building, theater and dance hall. Only the restaurant was completed when Charles Looff died on July 1, 1918 at age 66. The pier's future plans were put on hold. The Looff family seemed to lose interest in their 85% investment in the Santa Monica Pleasure Pier Company and instead concentrated on other projects and the building of carousels at their Long Beach factory. Finally in February 1923, to the relief of the business community, the family announced that they would sell their pier. A group of businessmen made an offer, but the deal fell through. Finally in September a syndicate headed by three local businessmen made an offer to the Looff estate that was accepted. They needed the money to expand their more profitable beach resort at Santa Cruz, California. The syndicate's Santa Monica Amusement Company had ambitious plans. First they planned to lengthen the pier to the 1050 foot limit allowed in the franchise. The additional space would be used to erect the finest ballroom on the coast and additional parking for its patrons. Frank Prior and Fred Church, Venice's famed roller coaster designers, were commissioned to design a superlative $75,000 twister coaster. They announced that all would be ready for the summer 1924 season. The eighty foot high Whirlwind Dipper roller coaster opened on Sunday March 30, 1924. The Aeroscope ride was moved seaward and installed on a new raised platform and the restaurant was moved next to the proposed dance hall. Plans were drawn for a new fun house, too. The owners commissioned architect T.S. Eslick to design the La Monica Ballroom. the largest on the west coast. He choose a Spanish theme for the building's exterior and a modified French Renaissance motif for the interior of the huge 2227 x 180 foot building. The building's interior could accommodate 5000 patrons at one time. The La Monica Ballroom opened with great fanfare on July 23, 1924. Customers, who bought dance tickets for a dime, dance the Charleston, fox trot and waltz on the ballroom's 15,000 square foot hard maple floor. They danced to the music of the La Monica Orchestra led by Don Clark who had come directly from Paul Whitman's Orchestra in New York City. The pier's success was attributed to both the new roller coaster and La Monica Ballroom. However expansion was put on hold when a huge storm on February 1, 1926 nearly demolished the pier. By the time that the high tide peaked at 1 P.M. that day, the pier had lost so many pilings beneath the ballroom that it was supported by less than two thirds of the pilings necessary to support its huge weight. Plans for new attractions were put on hold as $75,000 was spent to repair the ballroom and pier's structure. Finally in September 1927 the pier was sold to a syndicate headed by Dr. Frank J. Wagner, one of the previous corporation's four owners. While their were plans for expansion and ride improvments, the death of Wagner on June 27, 1928 changed everything once again.